Sometimes in life, you have one obstacle to overcome and if you manage that, you can look forward with optimism and confidence. Sadly, many people find that when they overcome one obstacle or barrier, another one appears out of nowhere to get in your way. Some obstacles can be overcome but some of them present too much of a challenge, especially when you have spent a great deal of time and used up a lot of energy battling previous obstacles and barriers. This may be the story for Isaiah Austin, who we covered last week in our NBA Draft preview. Austin hasn’t had to seek out his troubles in life and despite being blind in one eye, Austin pushed himself to the top of his abilities and was being regarded by many scouts and experts as being a good shout for the 2014 NBA Draft. Sadly, news has been confirmed that Austin has been diagnosed with a medical condition that may be career ending. 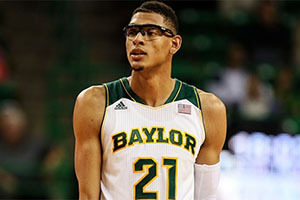 The player underwent genetic testing, which is part of the 2014 NBA Draft and the tests revealed that Austin suffers from a condition called Marfan syndrome. This syndrome comes about due to a genetic mutation which leads to connective issues in the tissues of the body. There are a number of features of this system with one of them being an enlargement of the aortic, and in some cases, this can be life threatening. The Marfan Foundation site says that around 1 in 5,000 people suffer from the condition. The player, hailing from Arlington in Texas and standing at 7 foot 1, was expected to be the first player to play in the NBA while being partially blind. The player first suffered an eye accident while playing baseball but this condition deteriorated over time and when a slam dunk while playing basketball in school caused so much pressure that his retina became detached. Austin battled back from these setbacks and he managed to have two strong seasons with Baylor before announcing he was looking to be part of the NBA Draft. Austin clocked up 73 games in this period, with 72 starts, and he managed to score an average of 12.1 points, 2.4 blocks and 6.9 rebounds in less than 29 minutes per game. Austin experienced on-court success with the 2013 NIT Championship and being part of the Baylor team that made it through to the NCAA Sweet 16 in 2014. While Isaiah will no doubt be devastated that his NBA dream now appears to be over, he should take solace in the fact that Baylor is ready to support them. Head coach Scott Drew announced that they hope Baylor will return to finish his degree and that there is a likelihood that he will be able to serve as a coach somewhere within the system for the team. While this news is bad for anyone that placed a bet on Austin to rank highly in the 2014 NBA Draft, it can only be hoped that the player himself manages to bounce back and still make what he can from his immense talent.